Embarrassed by your smile? Difficulty in chewing? We have your solution! Dr. Padolsky is very highly trained and experienced in finding the best solution for patients who have missing teeth or need their teeth replaced after they’ve been extracted. He uses the latest, most advanced high-tech equipment to diagnose and aid him in placing your dental implants. 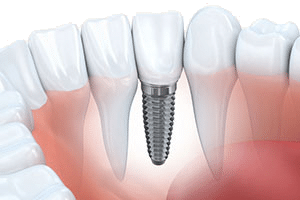 Dental Implants are titanium posts that are anchored into the jawbone, serving as tooth root or support for a single dental crown, an implant-supported dental bridge or an implant-supported denture. They provide a long-lasting, durable solution for missing teeth. In fact, if properly cared for, implants can last a lifetime. They look, feel, and function just like your natural teeth and are not vulnerable to tooth decay. Read more about the Advantages of Dental Implants. A dental bridge has long been a solution for replacing a missing tooth. But a bridge requires two usually healthy teeth to be cut down, which is not ideal. Bridges also tend to have short lifespans, from five to ten years. 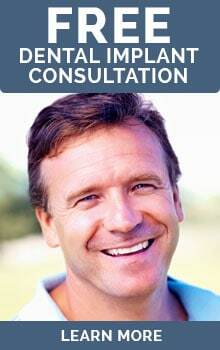 Dr. Padolsky recommends a dental implant as the best option for replacing a missing tooth. Dental implants do not require alteration to the teeth next to the missing tooth like bridges do, and with proper care dental implants can last a lifetime. When multiple teeth are missing, each missing tooth can be replaced with a dental implant. However, depending on how many teeth are missing, this can quickly add up in cost. An alternative is to use a dental bridge that uses implants to support one or more of the porcelain “teeth.” A dental bridge supported by implants is a fixed (non-removable) restoration and acts and feels very much like natural teeth. Dr. Padolsky has been creating beautiful, comfortable dentures for his patients for years. Traditional dentures are a good option when a patient is not comfortable with oral surgery and dental implants. Learn more about our dentures here. In this case, the dentures are supported by dental implants for more stability and comfort. The dentures are removable so you can take them out for cleaning. Your existing dentures can be retrofitted to work with dental implants. Denture stabilization requires a minimum of two implants per arch of teeth. The more implants used, the greater the stabilization. For patients who have very thin bony ridges or inadequate bone density, mini dental implants can be used to retain the dentures. But if the patient has sufficient bone density, regular size implants will be used as they have greater strength. This is the most natural-looking and functional replacement option. A series of implant-supported bridges are used to replace your missing teeth. Four three-tooth bridges, for example, can be used to replace a full arch of missing teeth. Chewing power increases to as much as 99% of the normal bite force and the bridges are made of natural-looking porcelain. You can get all new teeth in one day with Dr. Padolsky’s Same-Day Teeth procedure. This is a fixed (non-removable, except by the dentist) implant-supported denture. Learn more about Same-Day Teeth.